I LOVE putting oranges in my green smoothies. They just don’t taste right to me without them! And you should put some in yours too. BECAUSE…the oranges help you to absorb the iron in the spinach or other greens. Get all the iron you can and add an orange!! Yum yum. My green smoothies don’t taste right without fresh lemon, which is just a variation on your theme. Okay I know this is random, and you may have this somewhere on your site, but could you list out your recipes for your smoothies. Thanks for the iron tip. I, too, love oranges in mine. Mmm…yummy! I love this combo as well. And thanks for the iron tip too. I am not physically capable of drinking a green smoothie without at least a few oranges or OJ. Do you peel the orange and add the rest of the orange? WOW great tip – i’ll do it! 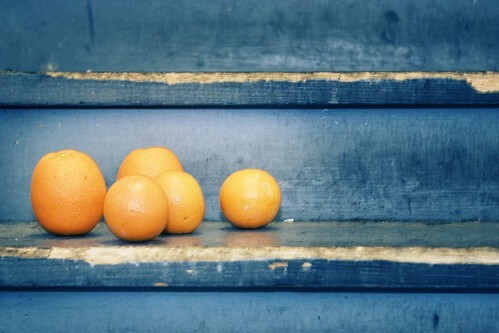 LOVE oranges. LOVE spinach. LOVE green smoothies. However, I have learned in the past week that it is NOT wise to drink green smoothies and forget to drink WATER in the heat of summer. Don’t let yourself get dehydrated! EVER! All of that passion and enthusiasm comes from a woman who recently spent the night in a hospital with a kidney stone. I gave birth twice naturally. Had my second baby at home. I begged them to let me stay on morphine last week. Begged. Drink water. Please. That’s all I’ve got to say. oh my goodness, i can’t believe i’ve been drinking green shakes for so long w/o putting an orange in them. I just tried this after I read your post, and I AM IN LOVE!! this may replace froz banana as my favorite ingredient. it gave such a little zip! thanks sara! I always serve mine over ice, fridge the rest! That picture was calming to my spirit. Thanks for including it! I’ve really enjoyed your blog since I found it last week. I think I’m almost caught up on your back posts! Thanks so much for sharing this part of your life with others. I’ve been looking for ways to get maximum iron absorption from my spinach. Thanks! What about other vit. C foods? Yum yum yum. And if you put in a frozen banana and half a vanilla bean…CREAMSICLE! I read all of your blogs and check back every few days to see if there is something new. I saw “oranges + spinach = happy” soooo many times, that I started to actually crave this combination (I am a green smoothie lover)!! The last trip to the store, as soon as I saw the spinach, it popped into my head… “I need spinach and oranges! !” I have been enjoying them all week. Thanks for the reminder! please post something new !!!! miss the new info and updates..
wow… that pic is beautiful!!! I thought you weren’t supposed to mix fruits with vegetables? Josh…greens are in a different category than broccoli, etc. You can mix greens with anything. I’ll have to try that. YUM!